Indonesia surprised the environmental community earlier this year when its climate action plan shifted away from saving forests and towards ramping up clean energy. But then its forests started burning, and now in Paris there are signs that forests and ecosystem restoration will play a larger role in the country’s climate strategy. 30 November 2015 |PARIS| As he boarded his plane to year-end climate talks here, Indonesian President Joko Widodo told reporters that he will use the 21st Conference of the Parties (COP 21) to the United Nations Framework Convention on Climate Change (UNFCCC) to push for international support to combat deforestation in his country – signaling a possible reversal from September, when the country shocked the environmental community by downgrading the role of forests in its climate action plan. 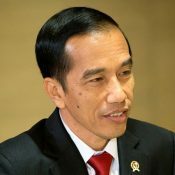 Last week, a high-ranking official with Indonesia’s Ministry of Environment and Forestry told Ecosystem Marketplace that the country was already re-evaluating its climate plan, or “Intended Nationally-Determined Contribution” (INDC), but that any official revision will not emerge until after the talks here conclude two weeks from now. The current INDC showed a drastic shift from land use change to energy issues as it was predicted that with increasing population, demands would also be rising. The previous commitment had focused primarily on forests and land use, which generate more than 80 percent of Indonesia’s total greenhouse-gas emissions. Henriette Imelda, a researcher of Institute for Essential Services Reform (IESR), a think tank which monitored the INDC process, said that there was a sense of rush in making the draft and its final document. But she also argued that the country had more than enough resources to do the job right. She added that Indonesia previously enjoyed a positive image in climate-change negotiations as the first developing nation to announce voluntary emission cut targets back in 2009. The INDC has been roundly criticized, both from inside and outside the country. Sarwono, however, defended INDC, and told Ecosystem Marketplace that it’s not meant to be a stand-alone document. REDD stands for “Reducing Emissions from Deforestation and Degradation”, and is a financing mechanism designed to slow deforestation. The government of Norway has pledged $1 billion to help Indonesia develop a REDD program, but that program has been on ice since the end of last year. Only a few weeks after the INDC submission, forest fires erupted in Palembang, South Sumatra, followed by Jambi and Riau provinces. Affected by El Nino, which carries dry weather, thick haze resulted from Sumatran fires begun to spread to neighboring countries, especially Singapore. It did not take long for forest fires to occur in Kalimantan and Papua islands. It took some time for the government to acknowledge that most of those fires were coming from poor land use change management, especially peatlands which are hard to put out once they are on fire. “Last year, from December to February, the government had implemented programs [to prevent land and forest fires] in Riau and West Kalimantan provinces. The results were visible. However, we missed out other regions as there is the factor of central and regional administrations interaction” said Minister of Environment and Forestry Siti Nurbaya Bakar. President Jokowi responded with a moratorium on permits for peatland clearing, as well as an injunction against clearing even for those who have a permit. Apart from the regulation, she said the government has been pursuing legal actions, applying rehabilitation programs, and considering ecosystem restoration model as part of strategies to prevent land and forest fires. “We will have to wait for March [which is predicted to be the early dry season] to determine its being a success or a failure to prevent land and forest fires,” she said. From private sector point of view, Dharsono Hartono, Chief Executive Officer (CEO) of PT Rimba Makmur Utama (RMU), an Indonesia-based company on ecosystem restoration, underlined the importance of President Jokowi’s decree on peatlands. “His statement is very crucial that there will be no more land clearing on peatlands. Not only limited to permit moratorium but also existing permits. It’s a positive move because it will ensure companies not to open peats anymore. Once you open peatlands, it will be difficult to restored and rehabilitated,” said Dharsono. His company obtained an Ecosystem Restoration Concession license for 108,255 hectares in 2013, around half of its total concession areas located within Katingan and Kotawaringin Timur districts of Central Kalimantan. The Katingan project concentrates on protecting peatlands and is listed as a REDD+ Demonstration Activity. Furthermore, he said that the project established close relationship with 13 villages to look for alternative livelihood, worked with six villages to built canal blocks and managed to form a team of 200 villagers as community fire fighters. Sarwono underlined that missing details in the INDC would not be much of a problem if Indonesia would be able to show successful efforts, such as REDD projects and other conservation projects, to tackle land and forest fires. Furthermore, he said that Indonesia will not hide or be defensive on the current massive land and forest fires. “We will be honest and admit that we have problems and shortcomings in handling those issues. It’s the best [diplomatic] move rather than playing defensive and turn everyone against us,” he added. The Ministry of Environment and Forestry is also on the clock to set up a financing mechanism to attract donor countries to support the country’s agenda to tackle climate change issues. It’s a role that had previously been handled by the REDD+ Agency, which was created as part of Indonesia’s $1 billion deal with Norway. The agency, however, was absorbed into the Ministry of Environment and Forestry, which was itself formed by merging two previously separate ministries. Before the merger, the REDD+ Agency had formulated a financing mechanism to manage funds for projects on forestry sector related to climate change issues. Former deputy chair of the REDD+ Agency, Agus Sari said that the financing mechanism, dubbed “FREDDI” for “Fund for REDD Indonesia”, was near completion before the agency being disbanded. FREDDI, which would adopt Funds of Funds characteristic, was established not only for managing Norway’s money but other potential donors for REDD projects. However, on the latest development, Minister Siti opted for another acronym for the financial mechanism, “ICCTF Plus”, short for “Indonesian Climate Change Trust Fund Plus”. “The Plus means to include more NGOs and professionals, not only ministers,” she said. Furthermore, she said that the trust fund will be under the authority of the Finance Minister authority instead of Bappenas. Under the Letter of Intention (LoI) with Norway, Indonesia was supposed to finalize its financing institution in 2011, with payments flowing through beginning next year, but the two countries have agreed to extend the deadline until June 2016 to set up financing and MRV agencies before full implementation of REDD+ in 2017. Meanwhile, Per Pharo, Director of Norway’s International Climate and Forest Initiative (Norad), Indonesia’s counterpart, said that they were still ready to support Indonesia’s effort in reducing emissions from deforestation and forest degradation. Pharo added that they welcomed Indonesia’s suggestion to set up a financing agency under the authority of ministry of finance. So far, he said, Norway had disbursed just US$ 60 million for REDD Readiness. Both Indonesia and Norway have agreed to appoint UNDP as the temporary trustee of the funding before permanent financing mechanism is set. Furthermore, Pharo said that Indonesia’s approach on peatlands management to tackle carbon emissions was very encouraging. Fidelis E. Satriastanti is a free-lance writer based in Jakarta and specializing on environmental issues. She can be reached at fidelis.e.satriastanti@gmail.com.